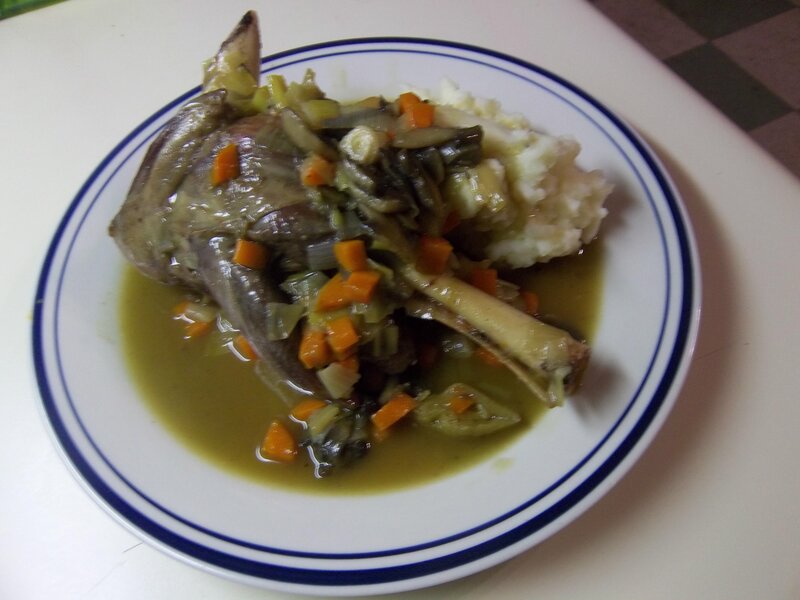 In terms of English food I think of lamb shanks as a very modern – last twenty years really – food. I discovered them when we lived in Glasgow in the sixties and I discovered that you can’t make “soup”, then the foundation of Scottish lunch, without them. In those days housewives headed for the butchers shop first thing in the morning and those who got there earliest got a lamb shank, later comers got a piece of neck about four inches long after the shanks had sold out. Then it was to the butchers for a leek, an onion, a large carrot and a “slice of turnip”(swede), a stick of celery and a bunch of parsley and thyme. Soup mix of barley, peas etc was of course in the cupboard, stocked up every couple of weeks from the grain store where one scooped it from open sacks along with its separate ingredients and a huge range of meals and flours – and even wartime leftovers such as dried egg. Diced veg, lamb shank, herbs and soup mix went on a low light at about 10am. At five to twelve the meat and herbs were fished out and the meat, which of course fell off the bone, diced and returned to the pan for the kids and husband coming home for lunch. Since my husband was eating sandwiches at work and I didn’t have kids I didn’t cook it often, though I certainly acquired a liking for its delicacy of flavour and was always happy if a neighbour invited me in – the whole building was scented with it every lunchtime as at least five of the ten households would be eating the same dish on any given day. But I did experiment with the ingredients for supper dishes and turned them into a braise, thickened with the soup mix, which I can recommend – just chuck the soup mix in when you add the water for a one pot dish. In post war England the shank was chopped and added to the neck as part of the tray labelled “stewing meat” and I don’t member it ever appearing whole south of the border until it became a restaurant dish. 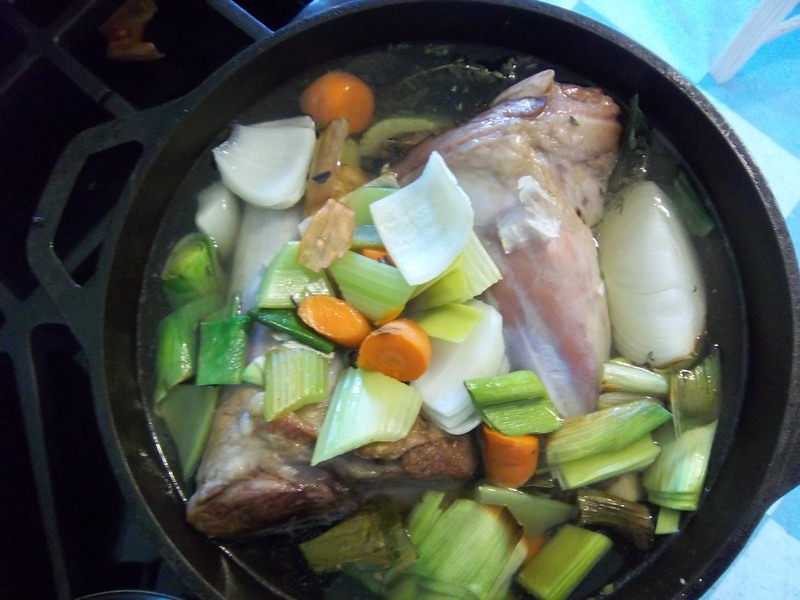 I did have Welsh friends who used whole lamb shanks in stew, fishing out the bones before serving it. If you’ve never tried it I recommend getting hold of a big piece of boned beef shin (obviously getting the bones cut into lengths and serving roast marrowbones separately) and braising it with vegetables, with or without stuffing – another good one from Grandma who always stuffed hers but doesn’t specify what herbs she used in the mix along with the breadcrumbs and chopped beef fat (and sometimes bacon fat). I like rosemary and a lot of black pepper but don’t use garlic in this dish – one of the few things I cook with no garlic in it! Grandma’s recipes are more aide memoirs than recipes – she assumes one knows what vegetables and herbs go with what and that one knows basic techniques. And what is in season – my aunt once told me that when she asked what a rolled shoulder of mild cured bacon should be stuffed with for roasting she got told “rabbit vegetables well chopped” – we decided that she meant the leaves that they would have gathered in the hedgerows to feed the rabbits so dandelion greens, sorrel, wild carrot and nettles probably featured. I meant to try it last time I cured half a pig but left the shoulder in salt too long for it to be good for roasting. Wowzas Kathryn! Thanks for the information on this one! I didn’t realise it was such recently-popular dish. 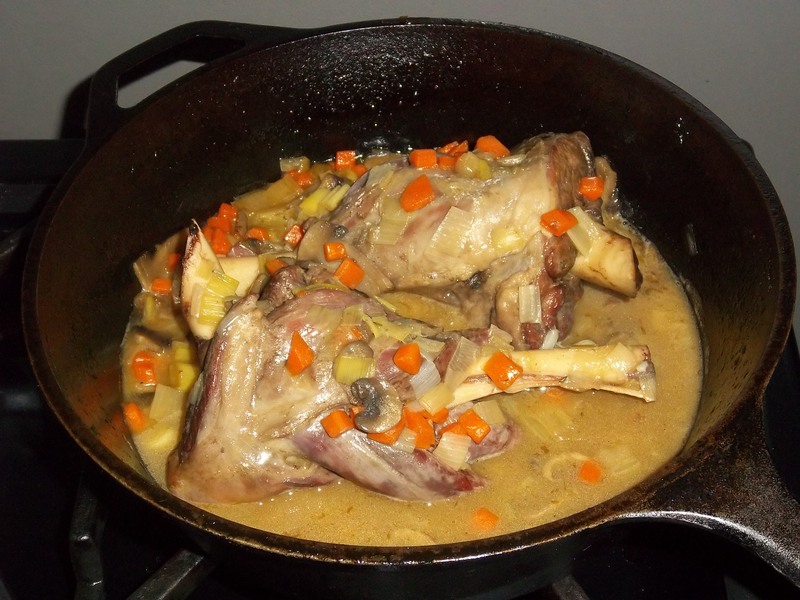 I rarely use lamb shanks just for stock, though perhaps they are a little more expensive than they used to be now that they are trendy. I have braised shin of beef before – it is one of very favorite meals. You can’t beat this kind of cooking. It’s having the time to cook it that is the problem! Even though you aren’t doing anything to it for three hours or whatever, you still need to be pottering about the house all day, though you have inspired me to cook it again. i’ll see what they have down at my local farmer’s market this weekend…. so did lamb shank originate in Britain?? That’s probably impossible to answer! This recipe is pretty typical of how Brits would serve lamb shanks, but they’ve been braised by many other folk – lamb shank tagine is the one that springs to mind. It’s pretty much the only you can cook them! Don’t think that answers your question though! ?